Due to several factors associated with Hurricane Michael, Virginia director Gary Conner has canceled the Kerr Lake event scheduled for 13 October. Kerr Lake is still 2 feet above normal pool because of Hurricane Floyd, and the immediate area around the lake will receive 4 to 7 inches of rain on Thursday and residual additional amounts Friday morning. Coastal and river flooding is expected as well as possible widespread power outages as the storm passes through as a tropical storm. This event will not be made up, and entries already received for this event will be placed in hold status. Registered members need to contact member services at 256-232-0406 to apply their entry fee to a later event. Richard Bates of Yorktown, Virginia takes the win on the Chickahominy River for AFT D13 on September 8th and 9th, 2018. By winning the Virginia Division Championship, Richard Bates became the division Angler of the Year. This was his third victory for the season. On day 1 Richard caught the biggest stringer of the tournament with five-fish that went 14.58 pounds. 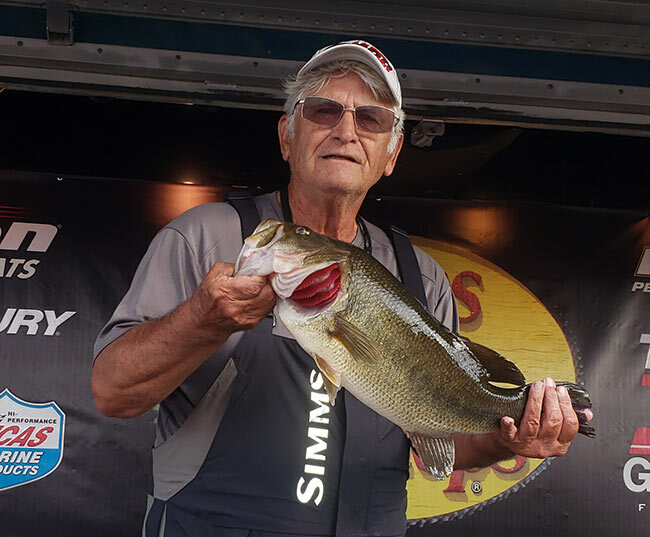 He went into the second day with a one- and one-half pound lead over the eventual second place angler James Funk who netted exactly 13 pounds Saturday. 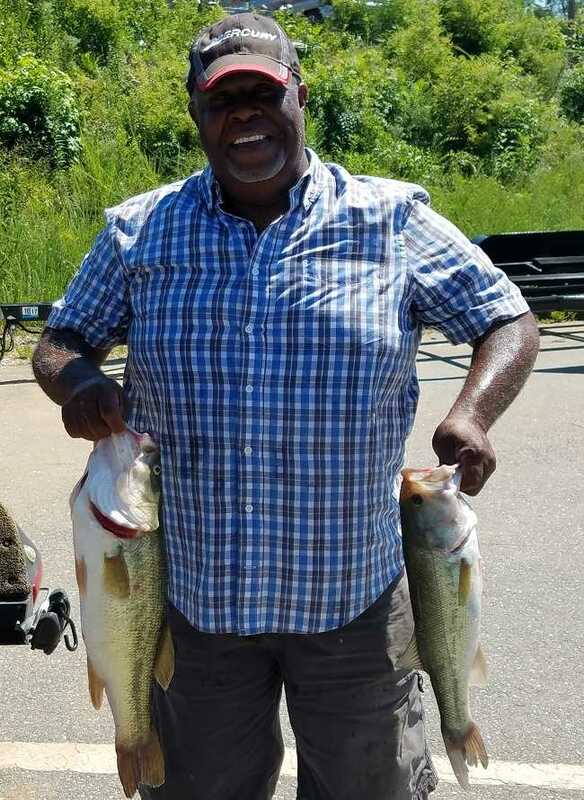 On Sunday Richard caught a second limit of bass that went 9.95 pounds and sealed a margin of victory of 1 3/4 pounds and won him the $1000 first place prize. Kay "KC" Choosakul came out on top at Kerr Lake Saturday 18 August, with the winning stringer of 11.91 pounds. 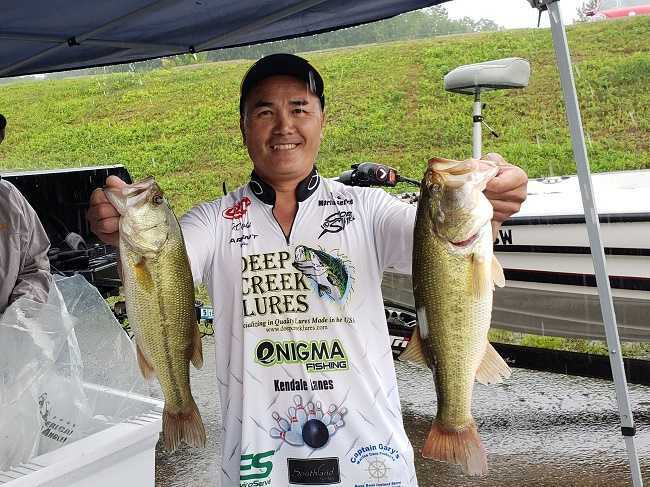 "It was cloudy and windy for the most part of the day, so I went to the backs of creeks that had wind blowing into them and fished laydown wood with a spinnerbait,” said Choosakul. KC took home $543 for the win today. In second with 11.12 was Randy Ruffin. 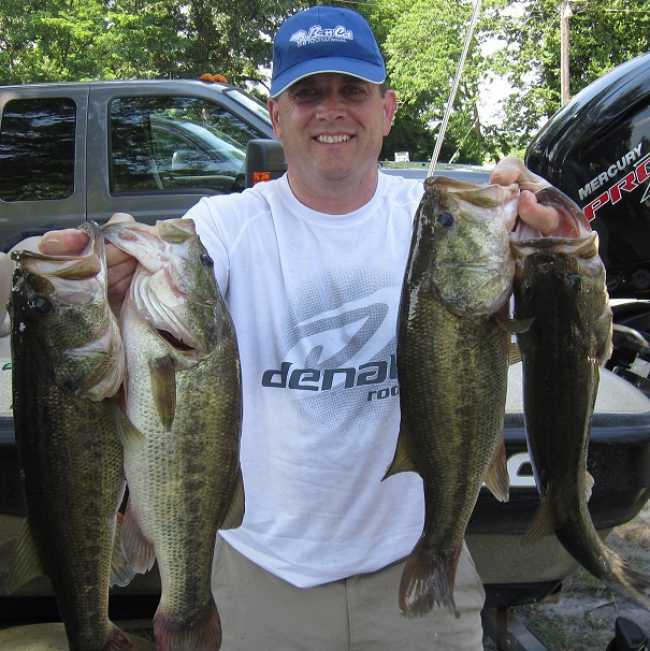 Randy had the big fish of the event with a very nice 6.18 pound largemouth. Rounding out the top three for this event was John Gillis at 8.62 pounds. It was a good day of fishing today on Kerr Lake, despite the rains. Most people came off the water a bit early due to a thunderstorm with lightning. That said, 22 anglers donned rain suits and competed in this AFT division 13 event at Rudds Creek. 15 of the 22 brought in 5 fish limits. Most of the fish came on plastics today, with reports from the fishermen that the fish hit just about any bait that hit the water. Unfortunately, most of the fish were small. 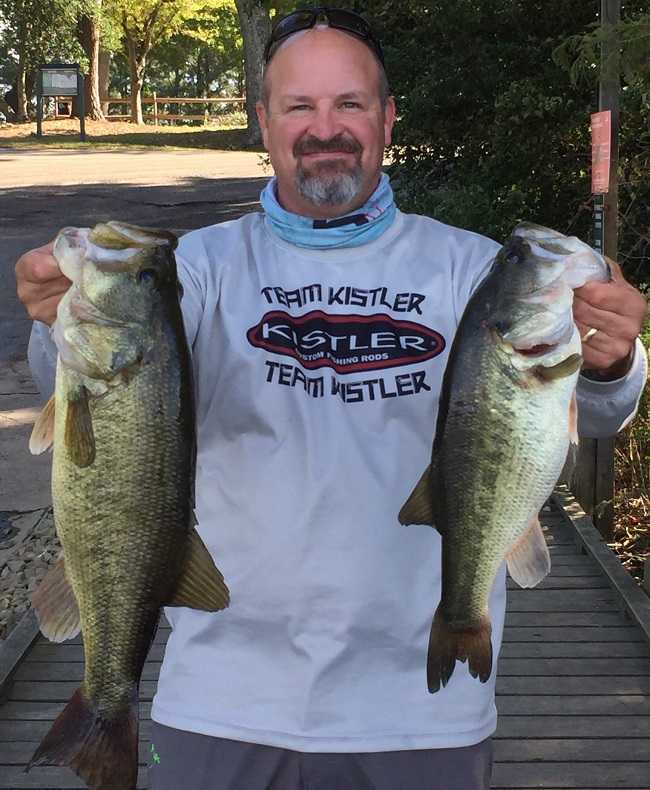 Fishing predominately plastics - worms and brush hogs - Mike Sims of Suffolk Virginia captured the win with five nice fish that tipped the scales at 13.68 pounds. This was Mike's last event with the Virginia division as he is about to make the move to Mississippi. For the win, Mike claimed 1st place monies of $559. 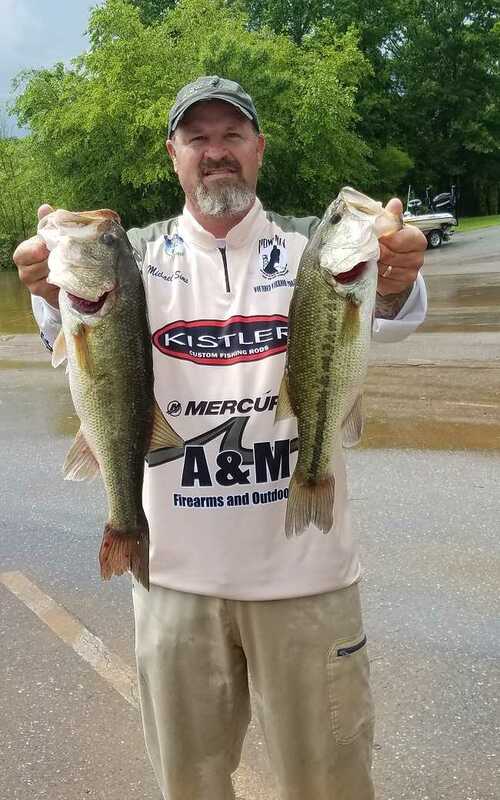 In what turned out to be a lopsided victory Richard Bates scored a four pound margin of victory on the Chickahominy River May 12. “This was a personal best for me on this river. Everything just fell into place today. All my fish came fishing Zoom plastics shallow. There had to be cover of some sort to find the fish. Every bite came when my bait was in contact with wood of some sort. The big fish followed the bait out from wood and struck a few feet after I had contacted the cover,” said Bates. 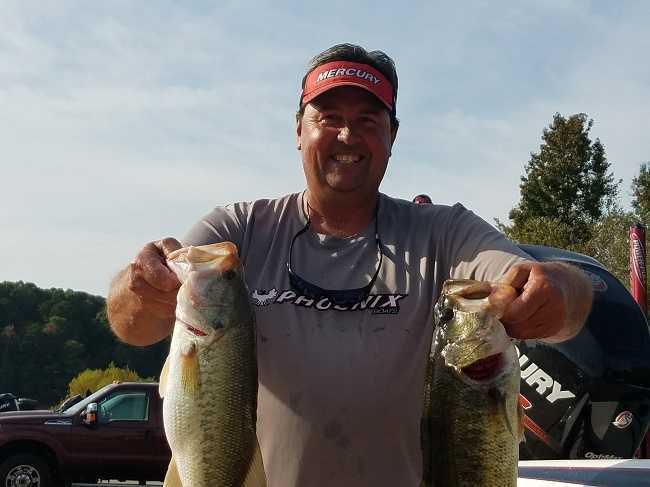 Mark Inman of Greensboro, NC won the RAM American Fishing Tour presented by American Bass Anglers Virginia Division 13 tournament held October 21st, 2017 on Kerr Lake. Running out of Rudds Creek near Boydton, VA Mark brought a five-fish limit to the scales that locked in at 11.30 pounds. He anchored his catch with a 3.52 pound kicker, which also took Big Fish of the tournament. Mark took home $451 for his victory. 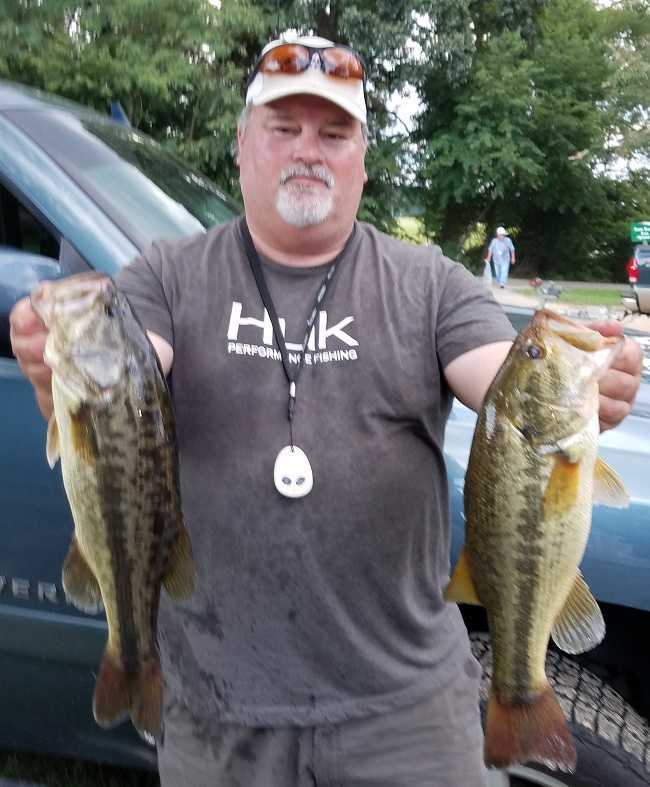 Visiting Maryland Director, Scott Randall of King George, VA won the American Bass Anglers, RAM American Fishing Tour Virginia Division 13 tournament held August 26,2017 on Lake Chickahominy. Running out of Riverfront park near James City, VA Scott brought back a five-fish limit that locked in the scales at 12.71 lbs. 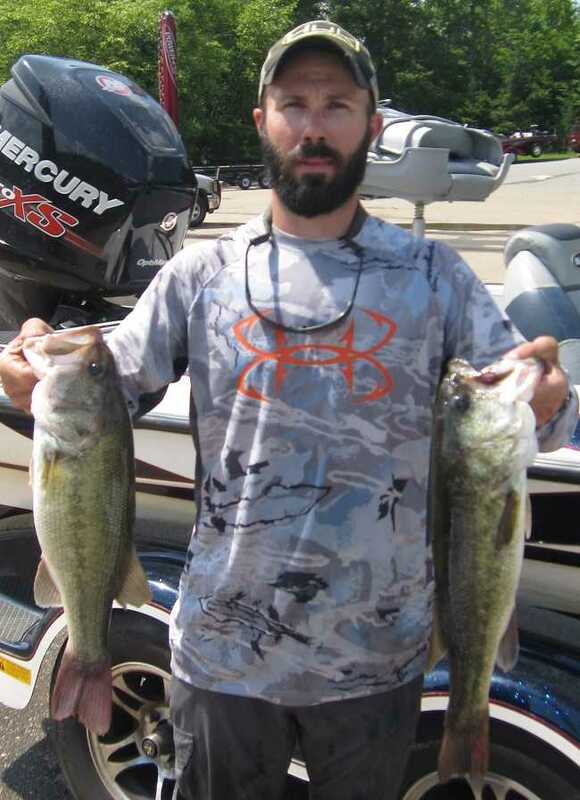 On a hot windless day on Lake Gaston, most of the field found it difficult to come up with a five bass limit of fish. 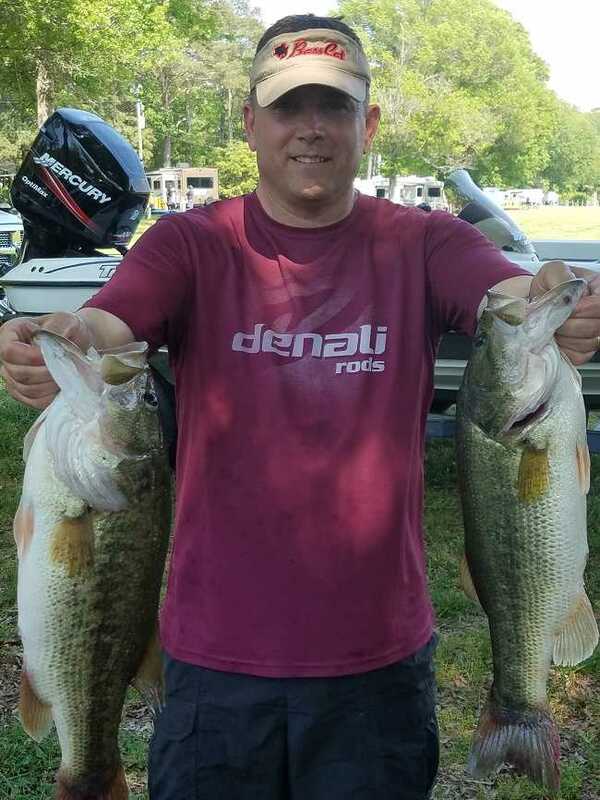 TJ Svec, however seized the opportunity to take his third division victory of the season by bringing in five bass that weighed in at 14.11 pounds. He anchored his catch with the big fish of the event at 5.06 pounds. He has been rolling through the season with three Division 13 victories and one division 17 win, all on different bodies of water. TJ Svec of Chesapeake, VA won the Ram American Fishing Tour D13, Virginia tournament hosted on Kerr Lake. 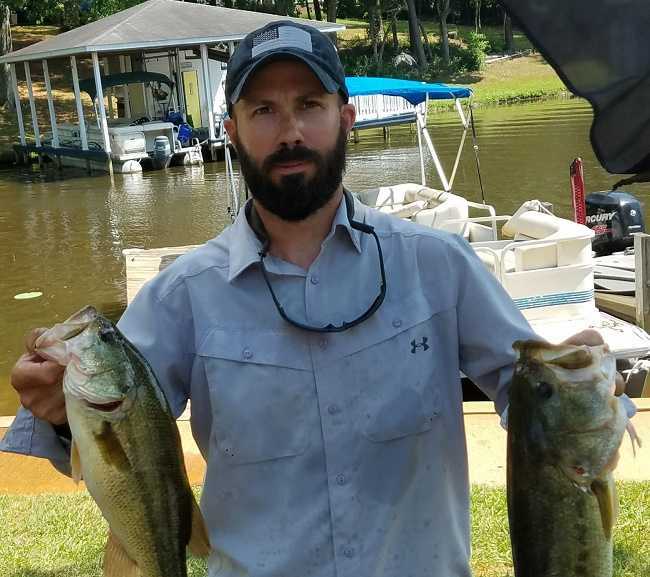 The event was held on June 10, 2017, launching out of Rudds Creek near Boydton, VA.
Richard Bates takes Chickahominy River win. 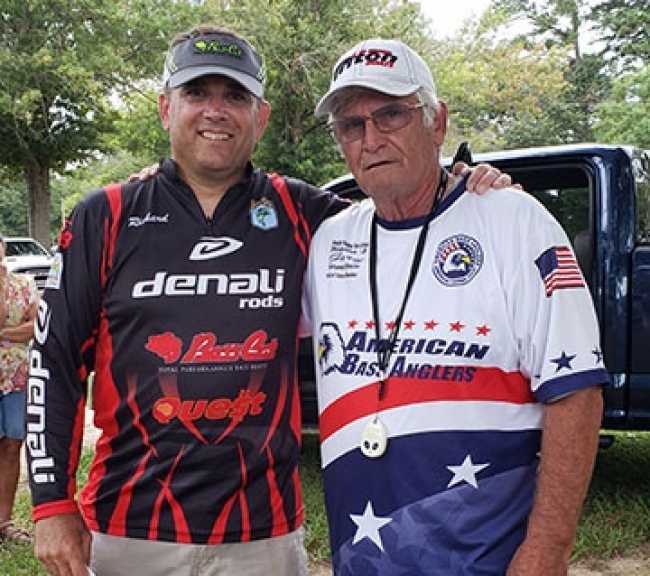 The Virginia division 13 of the American Fishing Tour kicked off the Memorial Day weekend with a qualifying event on the Chickahominy River. Athens, AL. The Virginia Division 13 AFT event scheduled for April 29 has been moved to Chickahominy Riverfront Park. In the interest of safety, the location of this event had to be changed due to excessively high tides and extensive floating debris brought on by four days of rain earlier in the week. 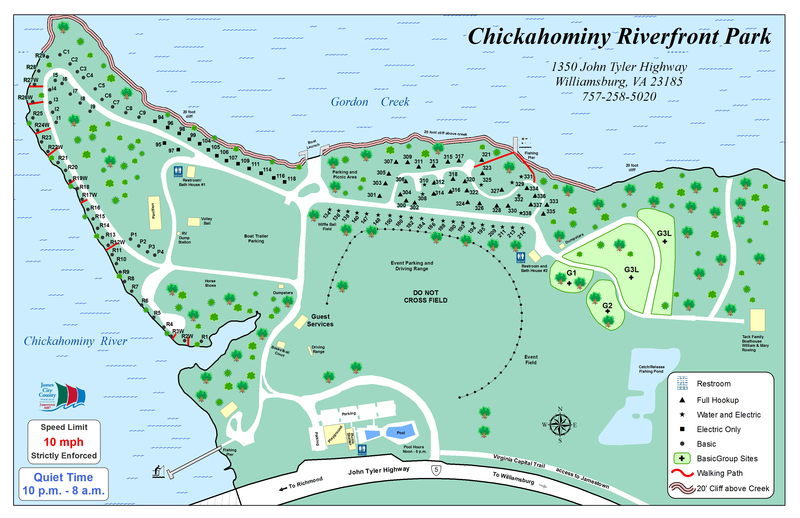 Riverfront park is located at 1350 John Tyler Highway (Route 5), at the mouth of the Chickahominy River. For more information contact the tournament director for the Virginia division, Gary Conner, 757-293-8651.